Chronic pain affects more than 100 million American adults, according to the Institute of Medicine. When chronic pain takes hold of your joints, especially in the knees, it prevents you from living the life you deserve. Pain is an uncomfortable feeling that tells you something may be wrong in your body. Although pain can protect us by telling us to rest after an injury, or to stop overusing that part of the body, the experience of being in a state of uncontrolled pain is frightening, and can have a profound effect on your quality of life. Studies have shown that traditional and conservative pain relief methods may not be the answer for many people suffering from acute or chronic joint pain. Doctors today can prescribe many types of injection treatments, such as ultrasound-guided injections, PRP (platelet-rich plasma) therapy, viscosupplementation, or corticosteroids. Ultrasound is a popular technology that is being used to help target the pain for patients directly, to relieve pain quicker, which also eliminates the need for surgery, and allows the patient to be on their feet in no time at all. In the case of knee pain, traditional injections did not always hit their mark, as the knee is a complex joint with different compartments. 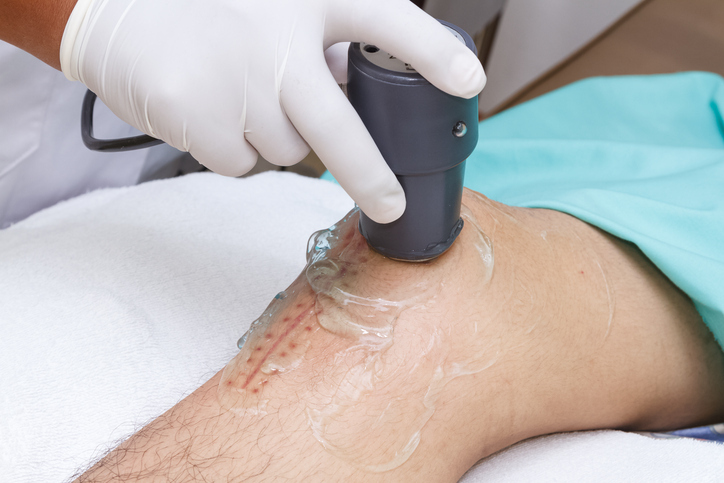 Ultrasound-guided injections are used to provide pain relief in different areas of the body, including the knee. For those who suffer from arthritis or tendonitis, in the case of knee pain, these injections help pinpoint the exact area of the injury. And in some cases, the use of ultrasound can help the doctor remove fluid from a swollen joint, rather than simply being for injecting medicine. The most important benefit of ultrasound-guided injections is accuracy. With traditional injections, the doctor feels the injection area for certain muscles, bones, and tendons, and estimates where to place the injection, which is not always successful in finding the site of injury and relieving pain. Regular injections are less likely to be helpful, as the area that needs to be reached by the injection can often be missed. Therefore, ultrasound-guided injections can help minimize complications, such as nerve damage. Ultrasound guidance allows the doctor to see inside the joint, including the nerves. This gives a real-time view of the needle under the skin, as it is directed towards the exact spot needed. Since the doctor can see exactly where they are placing the injection, the procedure is quick, and often less painful. The accuracy of these injections provides lasting pain relief. For those who need physical therapy and rehabilitation, these injections and reduction of pain can help the PT sessions to be more effective. Most importantly, due to the accuracy of ultrasound-guided injections, an increased success rate will often result in fewer injections needed to relieve your pain. Our goal at Powell & Jones Orthopedic Center is to treat pain using interventional techniques and a comprehensive, individualized approach. To provide the best care possible, our pain management specialists work closely with physical therapists, orthopedic surgeons, neurosurgeons, neurologists, chiropractors, and other providers who are involved in treating your pain problems. To learn more about ultrasound-guided injections, and how they can relieve your knee pain, call Powell & Jones Orthopedics Center in Birmingham, Alabama at (205) 877-9191, or request an appointment online.